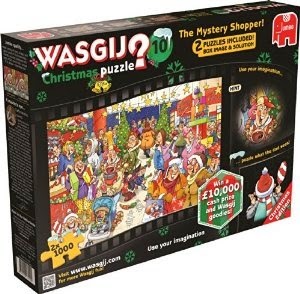 Wasgij (jigsaw backwards), the UK’s No.1 adult jigsaw puzzle brand*, has launched the must-have jigsaw puzzle this Christmas - Wasgij Christmas 10: Mystery Shopper! The 2 x 1000 piece festive jigsaw puzzle will bring family fun and entertainment to every home and a distraction from our digital screens this Christmas. The picture on the box depicts a department store crammed with shoppers trying to pick up the best Christmas bargains - but what has caught the eyes of these busy shoppers? Piece together the puzzle to reveal the solution. Wasgij, is unlike traditional jigsaws where you puzzle the image printed on the box instead you use your imagination and the clues provided to piece together a different image than what is shown on the box. But to make this Christmas puzzle even more special, you can also piece together the image printed on the box – making it twice as enjoyable. This Christmas Mummy To The Max has teamed up with Wasgij puzzles to offer one lucky reader the chance to win the Wasgij 10 Christmas Jigsaw Puzzle. To enter all you simply need to do is enter the simple rafflecopter below. These are great jigsaw puzzles.